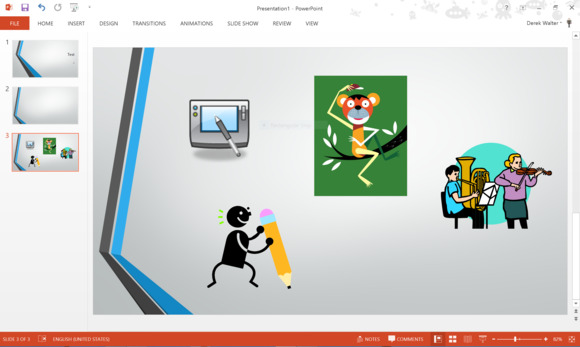 Microsoft is sending its Office clip art to the digital beyond, where it shall rest in glory with Clippy, Zune, and the rest of the Redmond saints. In other words, those wonky, yet charming images that graced countless PowerPoint presentations are in their last days. Microsoft already nixed the website where you could download Clip Art, so it may not be long before it disappears from Office entirely. These guys won’t be around much longer. So it’s time for a different plan. The good news is that Office already has better options for spicing up your files than relying on the dated and questionable-looking Clip Art. 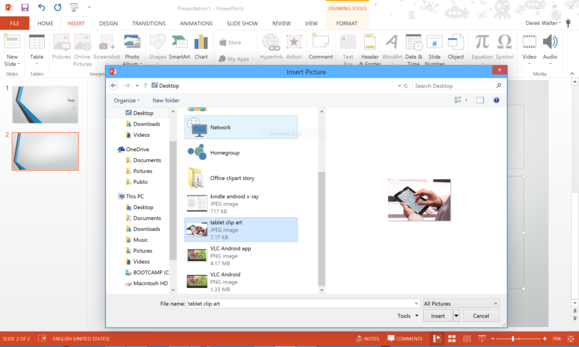 For example, Office’s integrated Bing Images search is solid, parsing the web for copyright-free images that you can use to bring some life to the staid world of business presentations. That’s not the only available solution, however. Here’s a rundown of your best options for grabbing the clip art that’s still there—and learning some new strategies for better images. When you want to add an image to your file, head to the ribbon and click Insert, then Online Pictures. 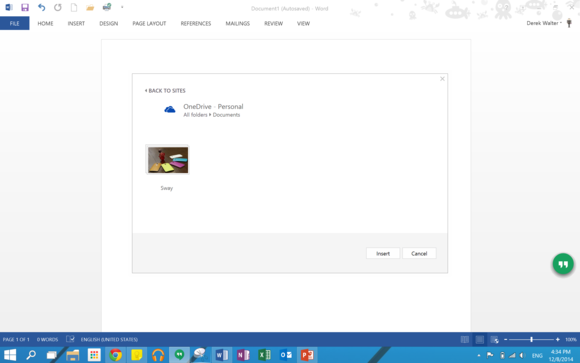 You’ll currently see three choices: Office.com Clip Art, Bing Images, and OneDrive. 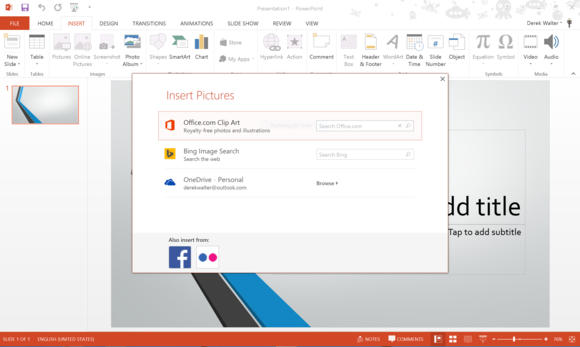 Choose from Office clip art, Bing images, or your own OneDrive storage. 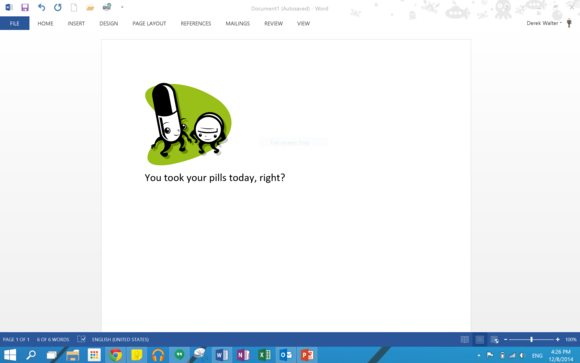 Office.com clip art still works for now, so charge ahead if that’s what you want to use. Type in your search term and then select your favorite zany image. It’ll appear directly in the file, allowing you to re-size and move it anywhere you wish. Microsoft did not indicate when it would exactly be eliminating Office Clip Art, so it could hang around for some time—though it didn’t exactly sound like that in Microsoft’s memo. Plus, if we’re being honest, Clip Art fell out of fashion at least a decade ago. Embrace the future! Keep reading to learn about more modern alternatives. Your audience will appreciate it. 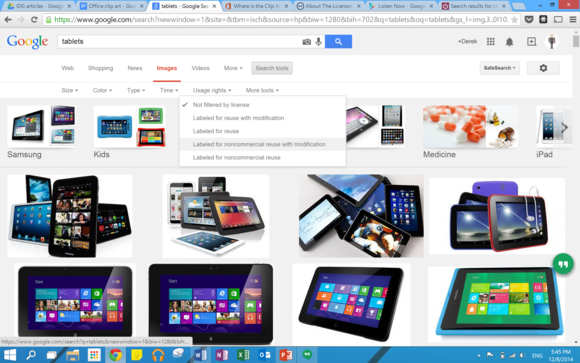 Bing’s Image search is your best option for finding and inserting images inside of an Office file. Sure, Bing may not be your search engine of choice but it’s actually rather good, especially at finding photos and other types of art to use. After you type in a search term (unfortunately there isn’t an auto-suggest) and pressing Enter you’ll notice a message about copyright files. By default all images are licensed for your use by Creative Commons. By default, Bing presents images that are licensed through Creative Commons, meaning their owner allows anyone to use, publish, or redistribute them without a copyright claim. This may sound like legalese nonsense at first, but it’s actually pretty important, especially if you’re presenting your images or publishing a Word document as a flyer or other kind of print version. If you use copyrighted images, you’re setting yourself up to get a nasty letter from the company or whomever holds the copyright to the images. If it’s possible that your work may see public eyes in any form, make sure you’re in the clear by sticking with licensed work. If you’re all-in with Microsoft then there’s a chance you’re using OneDrive as your cloud backup service. If so, then importing your own images into Office is way easier than digging through the Windows file menu. Any image stored in your OneDrive can be added right into your file. Unfortunately there’s no search option after selecting OneDrive as your file source—you just need to work your way through the scroll of images or folders that you have saved in your cloud storage. Once you’ve found the image you want you want, click on it and select Insert for it to appear in your Office document. There’s a reason Google still has the bulk of search market share; it’s usually better than the competition at finding exactly what you’re looking for. Such is the case with finding images. You can always just fire up your browser of choice and head to Google’s image search. There are a couple of additional tools to help you sniff out proper images to use. After conducting a search, you’ll see different sub categories with previews of other image groups. You can check any of those and see if something tickles your fancy. Yet again you have the ability to make sure you’re not violating copyright law by restricting the search to free-to-use images. Click Search Tools and Usage Rights. There are five different types of options that vary by how you intend to use the image. Select the one appropriate for your particular case. “Labeled for reuse” means you can use it for business or commercial works, or anything else you have in mind. “Noncommercial reuse” means you can’t use the image in a work that will be sold or shown to the public in a way that will make you money. The world’s biggest clip art collection is on the Internet. Once you see an image you want, right-click and save it to your computer. You now have an image ready to import. 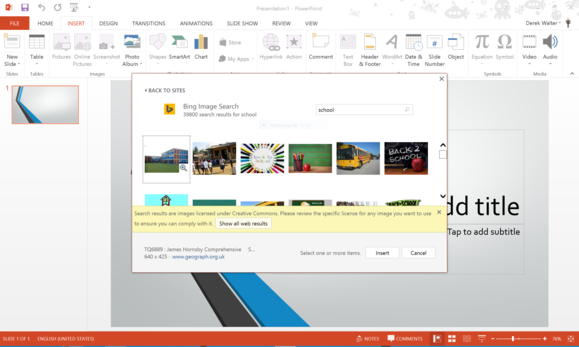 Go back into your Office project and select Pictures from the Insert tab and it will fire up the Explorer menu. Just find what you downloaded and insert it into your file. Upload your new find from the Internet right into your Office file. Once you’ve used Bing, OneDrive, or Google search to find pictures you’ll forget all about those zany Clip Art images. Well, some of them are hard to forget—but at least you won’t be caught using them again.